Even before he announced his candidacy for President, Sen. Bernie Sanders touted a plan for America’s infrastructure. His bill, the Rebuild America Act of 2015, would cost around $1 trillion and create and maintain 13 million jobs. It seems like a hefty price tag, but given the fact that the infrastructure in the U.S. is crumbling, it is well worth it. When we compare the U.S. with our counterparts in the OECD, the results are not good for America; however, things have improved since the report. According to the OECD’s “2015 Going for Growth,” U.S. spending as a percent of its GDP has increased to 4.1% (the OECD average is 3.5%). Additionally, the World Economic Forum’s Global Competitiveness Index ranked the overall quality of U.S. infrastructure at 16th (we were 24th in 2012). While that is illustrative of improvement here, it is surely still not what one might expect from the world’s largest economy (based on GDP). “One in nine of the nation’s bridges are rated as structurally deficient.” (p. 6) This means that they are restricted to light vehicles, closed to traffic, or require rehabilitation. In Wisconsin, 8.5% of the bridges fit this description. 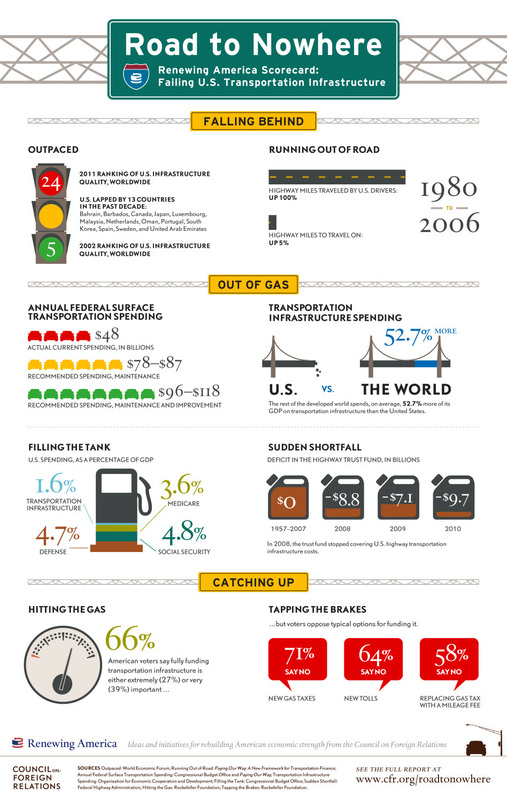 “42% of America’s major urban highways remain congested, costing the economy an estimated $101 billion in wasted time and fuel annually.” (p. 48) The ASCE estimates the fuel lost at 1.9 billion gallons. 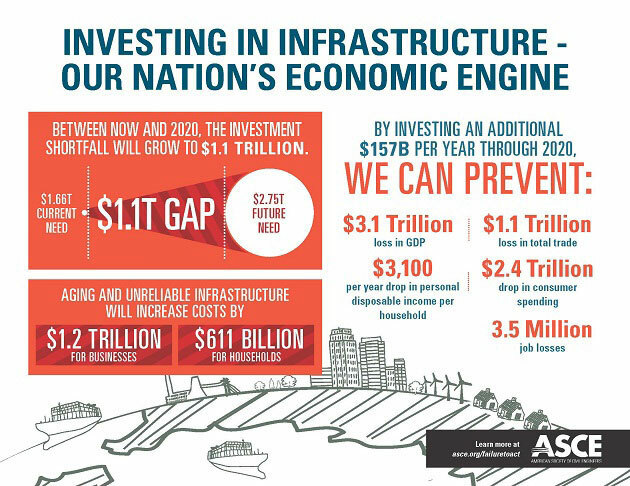 The U.S. government cannot keep putting off funding and investing in infrastructure. At the current rate, the funding gap is projected to be just over $1 trillion by 2020 and almost $4.7 trillion by 2040. (p. 7, Failure to Act). In 2010, 76% of U.S. exports and 70% of imports arrived via ports (p. 41, Report Card). If the roads, rail system, and inland waterways to ports (as well as other modes of transportation) are not sufficient to handle the movement of goods, it could spell economic trouble. 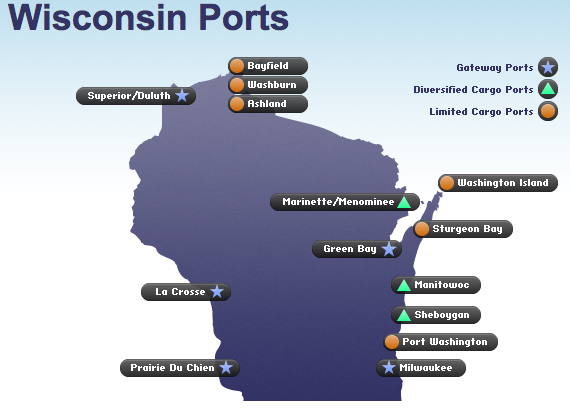 Ports are an important part of the Wisconsin economy, as they handle approximately $2.4 billion in goods every year. Additionally, “deficient and deteriorating transit systems cost the U.S. economy $90 billion in 2010” (p. 51, Report Card). Improving and increasing transit systems would help those without access to automobiles get to places of employment or stores. Additionally, passenger rail helps decrease wear and tear of roads, as well as reduce congestion of roads and highways. Undertaking a massive plan to overhaul U.S. infrastructure not only helps businesses and trade, it also helps workers. According to a recent report from the Brookings Institution, “every $1 billion in highway spending can directly and indirectly create up to 13,000 jobs a year.” Additionally, many infrastructure jobs have low barriers to entry, which makes it easier for workers without a four-year college degree to find employment. Since infrastructure workers do, however, need recruiting and training, this is an opportunity for technical colleges to offer more programs. The bill also called for a National Infrastructure Bank, which would help address the problems with funding and investment I mentioned above. I look forward to the Senator expanding on his plan in the coming months. What are your thoughts? Should the U.S. be worried about its infrastructure, or are the ASCE and other organizations blowing things out of proportion? Thanks for reading.